The New York Times once named ATL the "Zombie Capital of the World", and Jayson Blair didn’t write the story so it’s definitely true. With that in mind, it’s high time A-Town got stormed by RFYL, registering runners now for a 5K that out-horrors any you've ever entered (including that three-legged one you did with Seth with the inner-ear problem) by having you sprint through a maze of gut-testing obstacles while getting chased by members of the undead. The only way to earn your finish-line survival medal is ducking/ dodging/ almost-dying your way around zombies trying to "kill" you by snatching away all three flags from your "health belt", as you attempt to best 12 obstacles such as The Terrible Tubes (a mud/trash-filled "sewer system"), and a series of fences called "Over-Unders", where you can shake any zombies with crippling gambling addictions. 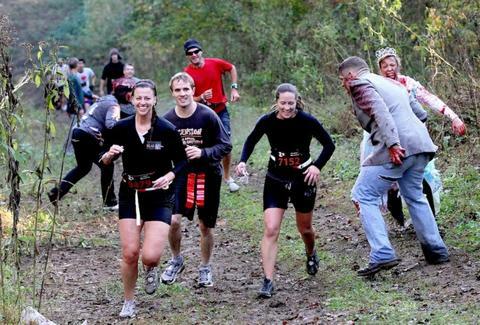 Ok, so while they're not actual "zombies" (they're volunteers…but they graduated from an esteemed "Zombie Training Facility”, so quit hatin'!! ), they're still dangerous, and you can even sign up to be one, a job that comes with perks like a t-shirt, a beer, snacks, and passes to see 15+ bands at the Apocalypse afterparty, which the Mayans predict...will be totally awesome!!! To get everybody in the undead spirit, they're having a "Brews and Brains" bar crawl in L5P this Sat starting at The Vortex, with zombie-themed drinks, discounted beers, limited-edition swag for the best-dressed undead, and even a souvenir mug, which Jayson Blair would call "a far more interesting thing than a souvenir mug".